My photos don't do justice to these berries but when you have strawberries this beautiful, it is almost a sacrilege to cook or bake with them - unless you have loads of them sitting around. Plenty of these, I have not. I bought my 2 precious punnets in Japan 2 days ago for a fraction of the price I would need to pay for similar superior grades here in Singapore. Each perfect heart-shaped fruit beckons with its jewel-like ruby red colour. These fruits are totally in a league of their own - far from the sickly, dull coloured and odd-shaped versions we get at our neighbourhood supermarkets. 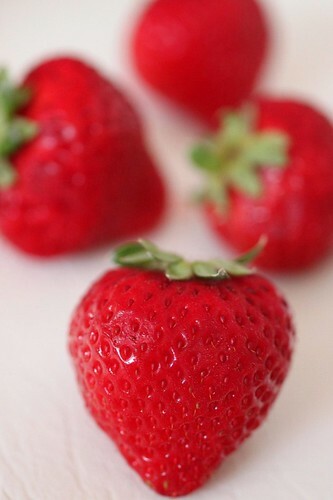 The only place one can find beautiful strawberries here in Singapore would be at the Japanese supermarkets which air-lift these precious fruits every year and sell them at a hefty price. I have always associated the 'sweet bubble gum' strawberry flavour you get in strawberry candies, milk, juice etc with 'fake' articifical flavourings created by food chemists in the lab - that is until today, when I tasted these wonderful Japanese strawberries that I realised that such sweet candy like flavour does exist in the real strawberry fruit. It is hard not to yield to the temptation to make something with these fruits. Hence in order to stay true to the original flavour of the strawberry fuits, I decided to make a cold dessert and aside from good champagne, I guess the next best pairing for strawberries would be cream. In Japan, where you find strawberries, you would almost always find tubes of condensed milk placed beside them. 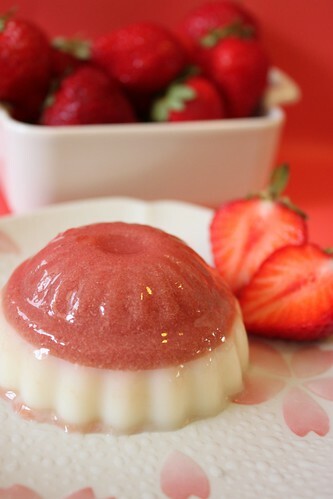 Hence, I decided to make a soft pudding like Strawberry Cream Jelly. 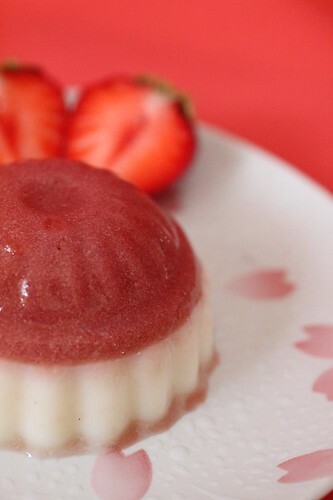 I had used a little more gelatine because I had wanted to get a firmer pudding so that it would demould and photograph better, otherwise, the gelatine quantity can be reduced (1gram less) to get more smoother and creamy texture. How was the taste? Delicious with a capital 'D' - and I humbly attribute the beautiful taste to the strawberries - I cannot take any credit for these. 1. 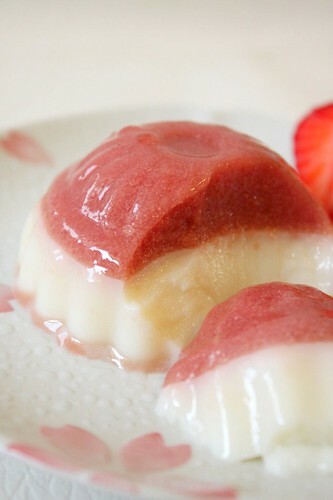 Mix gelatine with hot water until transparent. Set aside. 2. Add strawberry puree,sugar, lemon juice into a saucepan. Heat to dissolve sugar. Add milk and heat into just before boiling. 4. Pour into mold and set until firm. 2. Add milk, condensed milk and sugar into a saucepan. Heat to dissolve sugar. Add vanilla extract. Heat until just before boiling. 4. Cool mixture down to 40C before pouring over set pink layer. 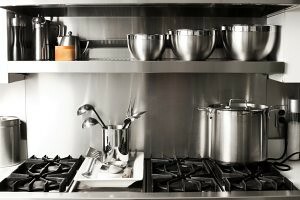 I didn't have much mood to cook lately. The weather is either too hot or too wet! Such dessert refreshes the soul and the palate! The sweetest, sweetest ever strawberries I had was at Black Forest, Germany. Amazing & I could not forget how naturally sweet and tasty they were! They are so sweet..like the berries...Beautiful . 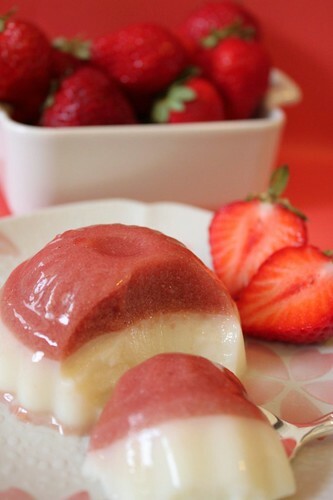 But I think if u treat the strawberry with an egg yolk before u add the milk, the visual effect will be much better. Taste effect will be smoother too. beautiful Shirley! love the red and I bet they taste wonderful as well. Shirley, they look awesome but I think the lemon juice might have just curdled up the milk a little. I could see specks of whites in the pink layer, nonetheless, awesome possum! oh yum! 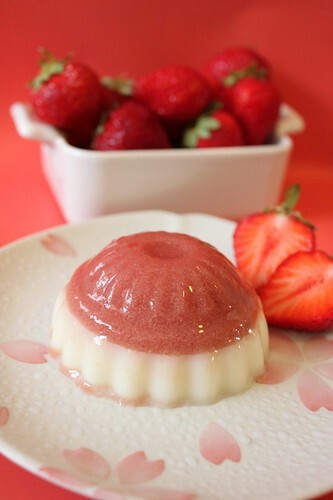 i love condensed milk~ it goes so well with strawberries! My mouth is watering...the pictures are so beautiful! I can't wait until our strawberries are ready to harvest! Thanks, Wendy and Quinn for your insight. I actually hesitated to add milk or other stuff to the strawberries- they are already so good so their own. You've got very very nice strawberries! It makes refreshing jelly! Nice one! 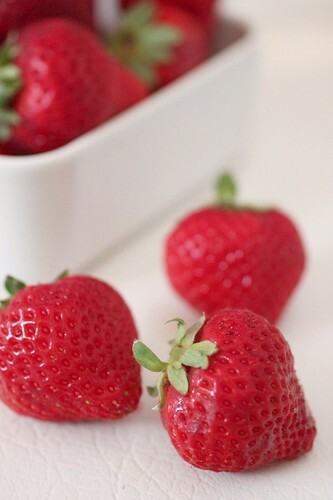 I have a love affair with strawberries. And this is the prettiest and most elegant dessert I've seen employing these berries!